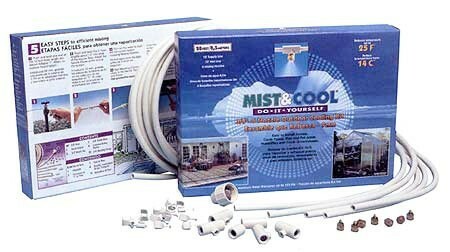 Complete 6 nozzle starter kit including 22' (one 18' & five 2' pieces) of 3/8" polyethylene tubing, 1 tubing to 3/4" hose thread adapter, 5 3/8" compression-lock nozzle tees, 1 3/8" compression-lock nozzle elbow, 6 brass misting nozzles, 12 wood mounting clamps. WARNING: This product contains chemicals known to the State of California to cause cancer, and birth defects or other reproductive harm. For information, go to www.P65Warnings.ca.gov.